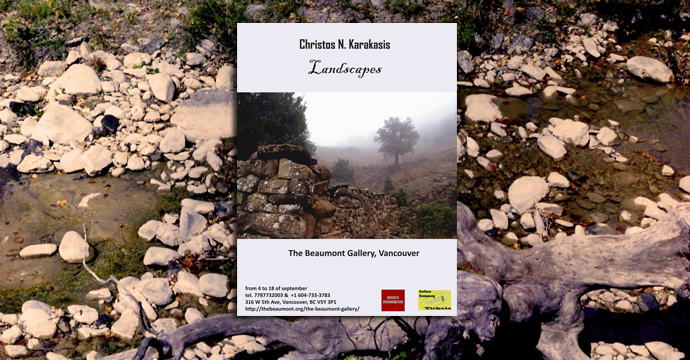 18 landscapes, produced with 35mm photography technique, by the internationally awarded Film Director Christos N. Karakasis. His Landscapes have been exhibited on wall size printings in Moscow and other cities of the world. His work full of clarity and energy is an amazing conception of Greek land and its landscapes. His works have been exhibited in many countries in very large prints, but also in Finland where he first cooperated with Vasiliki Kappa, at her exhibition Invisible Cities, with his film Take A Trip, which was projected in a special installation. He recently participated in the Photography Exhibition entitled "Greece: Moments of Personal Happiness" in Moscow, which was inaugurated on January 22, 2016 at the Na Kashirke Gallery. Christos N. Karakasis is known for his films, which have won international acclaim and are screened in many countries. His photographic work, filtered through the director's eye, is mainly a set of images that not only meet the standards of a photograph but also of a film shot. Here, the initiated can listen to distant voices and contemplate forgotten images. The mountainsides, with their sharp vertical massifs, surround the landscape tightly, like there is no way out… The aquatic roads however split the mountainous castles and the incessant rhythm of the water satisfies man's sense of escape… The song of the fountains gives hope and so the journey continues within paths never walked on before. This land is hospitable in its ruggedness, as beauty is born from steep stone roofs, trunks and rock is present everywhere in all its expressions. Stone streets, stone roofs, dry stones, boulders and water… Even so this ostensible monotony is transformed to a charmer, who magnetizes the look, a tool of introspection, which reveals countless emotions, ancient thoughts… Thus, here, the involuntary escape is realized and the traveler finds a land shelter. Christos N. Karakasis was born in Athens. He studied Film-Theatre-TV Direction, Computer Science, Music and Humanities. He has a Postgraduate Diploma in training and development, and a Postgraduate diploma in Film and Theatre Direction. He has supervised, technically supported and produced various audiovisual events, presentations, adverts, video art projects, festivals. As a Director-Producer he is active since 1992. His films have been screened in Greece and abroad and have been awarded in international film festivals. He is a member of the “Greek Directors' Guild. He is the Artistic Director of “ATHENS INTERNATIONAL DIGITAL FILM FESTIVAL” (www.AIDFF.com), which achieved alignment with the major international developments in the Cinema era, which is steadily moving towards the Digital Age. He is the Artistic Director of the “INTERNATIONAL SCIENCE AND ECOLOGICAL PANORAMA”, which contributes to the dissemination of science through the power of new media and digital technologies currently used by scientists around the world. He is the writer of a book titled “Introduction to Cinema” which can be helpful to all aspiring filmmakers, but also to those who want to study in a direct and concise manner the art and technique of filmmaking.